Welcome to Centerpiece Wednesday and Tablescape Thursday. Come imagine the smells of apples and pineapples that await you as you sit at my table at Red Couch Recipes today. The pineapple is the universal symbol of welcome. When Columbus came to the Americas, he and his men soon learned that if a pineapple was placed near the entrance of a Carib village, they were welcome. The pineapple as a symbol of welcome then spread to Europe and then to the Colonies. In Colonial times, when entertaining, pineapples would be placed in the center of the table as a symbol of welcome. 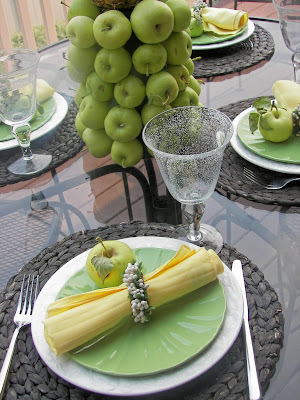 The highlight of this tablescape is the Pineapple and Apple Centerpiece which welcomes you to my table. Thanks to my friend Helen for the summer apples used in this centerpiece; Helen didn't mind if I "wasted the apples." The centerpiece takes 40-50 apples. 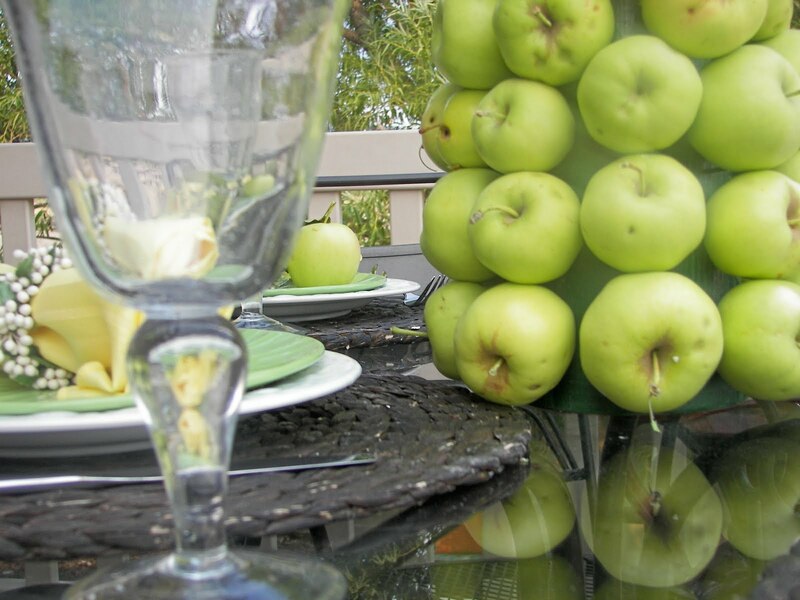 I have had the base of the centerpiece for about 20 years and never used it; you see, I hate to "waste" apples. 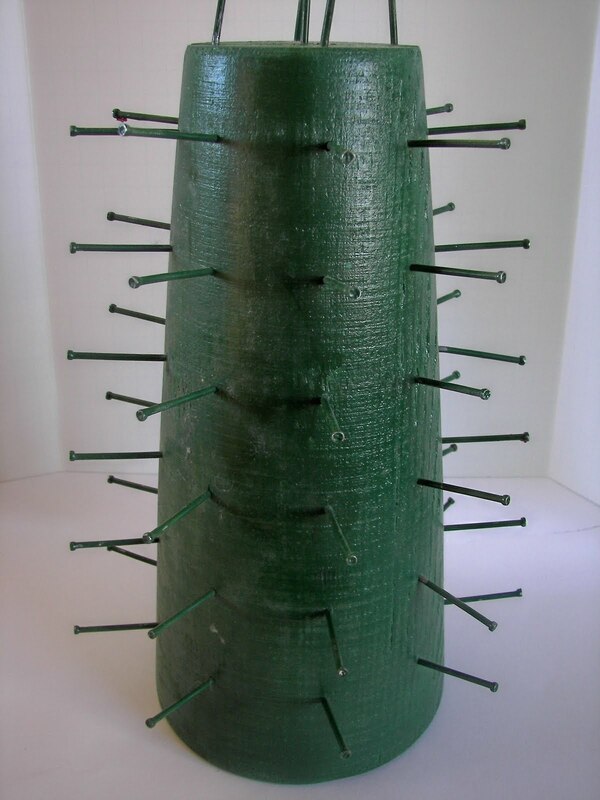 The apples are anchored to the cylinder-shaped base with nails; once used they are not edible. If you want to read the story about how I acquired the centerpiece form, look at the bottom of my post. 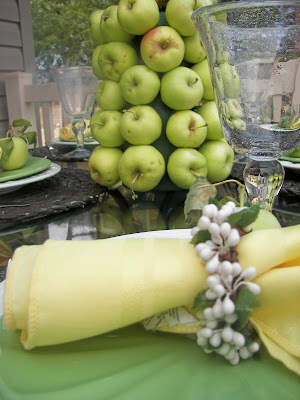 Look at all the apples used in the centerpiece.﻿ You have to be patient to find the right apple to fit in the right nail. On the other hand, the pineapple pushes on quite easily. The place setting is simple. The plates are embossed with apples and pears. 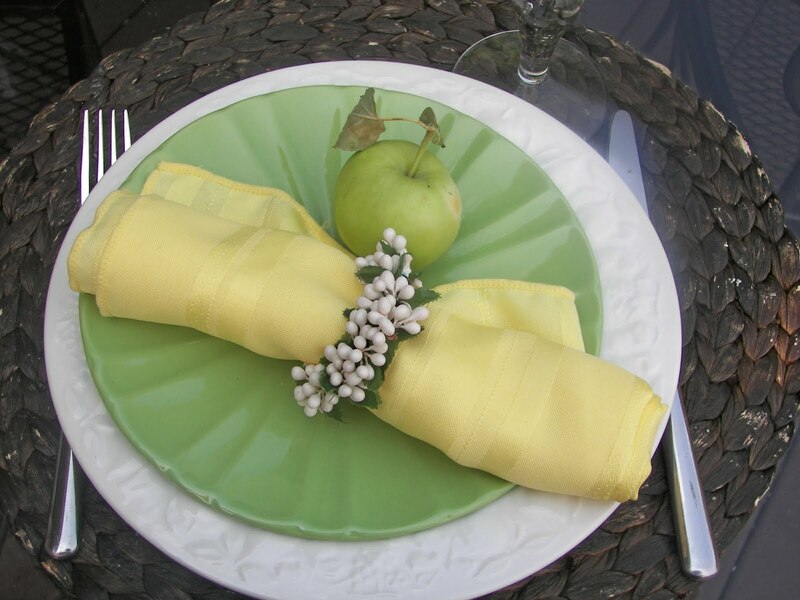 The place setting is enhanced with Style Sisters napkin rings. I do tend do overuse them because they are so pretty and versatile. Light reflects beautifully through the bubble glasses. A view of the whole table. I love the reflection of the centerpiece on the glass. About 20 years ago, while at a conference, I bought this form at the "Christmas in the Adobes" in Monterey, CA. At the event, many of the adobes, some of them privately owned, are opened up for tours. It is held at night and the adobes are lit only by candlelight; the entrances of the adobes are lit by luminaries. Hostesses are dressed in period costumes and period decorations. In one adobe there might be a hand bell choir, in another you might hear a Jalisco guitar. 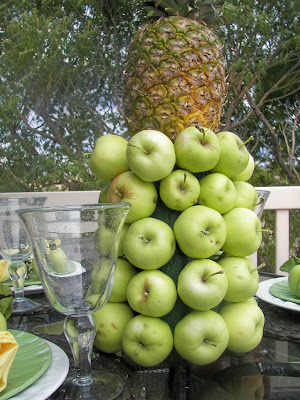 Some of the homes, showcased these pineapple and apple centerpieces; I fell in love with them. Christmas in the Adobes is celebrating their 25th Anniversary this year; if you live nearby and haven't been, it is really a special event. Influenced by the enchantment of the evening, I bought one of the forms at the gift shop for $25. Through the years my husband had great fun with it...more than $25 of fun! On a couple of occasions, he even brought it out for guests and said something to the effect, "Look at this wood cone and nails my wife bought for $25!" After twenty years, I am glad that I finally put the form to use and I think it looks and smells wonderful. Thank you for stopping by and sitting a spell on my Red Couch. I hope you enjoyed your stay. I had one of those once. Have no idea what happened to it but I know I never used it!!!! My husband had some fun with it too. Have a great weekend. I love your green and yellow, and the centerpiece is FABULOUS!! I bet you use it at Christmas also? I love that! A LOVELY table Joni! Years ago when my husband was in the military, we lived a short time in Albuquerque. We were there over Christmas and I just LOVED all the adobe homes adorned with luminarias for the holiday! So simple and yet so gorgeous! Beautiful table. I love the greens and yellows. Soft yet vibrant!! Ignore the man about that form, now that you've put it too good use! Joni, Your tablescape is lovely. Love the place settings. I can just hear my husband if I had bought that! It is very neat and an interesting piece, now onto making apple pies?? Thanks again for your support and great ideas. OH and have I told you how much I am enjoying the dressings! They are soooo delish! What a tease your husband must be! LOL! I have a similar form from Williamsburg, but I've only used it around Christmas time. Thanks for the inspiration to use it for other occasions! 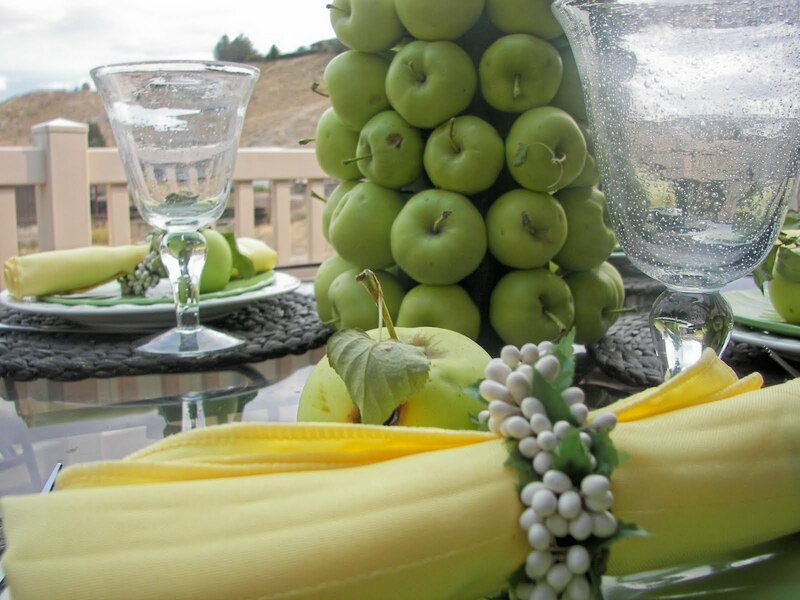 The green apples look stunning with your yellow and green themed table! What a fun centerpiece, I know it smells great! I'm lovin' the soft greens and yellows of your setting-enjoy! Very pretty table, Joni...love the fruit tree centerpiece. That's a fabulous centerpiece, Joni. Thanks for sharing the story behind it. I really like the green salad plates and your bubble glass too. How welcoming. I am in DC with Jessica and our former babysitter Rachel and they have the welcome pineapple everywhere. It was a symbol in Virginia. This is really fun and I love the form for the fruit. No, the mural has been there for 7 years now. We did it right after Jessica's wedding. I don't think the napkin rings are overdone. They always make it pop. I really think the best thing about tablescaping is that it makes us get out all of those things we haven't been using for years! It really does make a great centerpiece and it must smell wonderful too. Your table is beautiful and I agree, the photo with the reflection is very special. Oh I just love your apple green table! 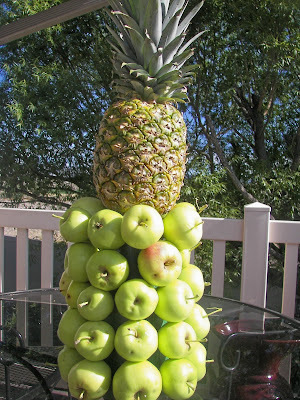 The pineapple/apple topiary is so fun! I'm going to have to try and make some for the holidays..I can envision all kinds of fruit...just gorgeous!! Love the color scheme and the centerpiece is both beautiful AND scrumptious-looking! Thay looks pretty, Joni! Just a hint of Fall. Couldn't you cut away the part that touched the nail? I couldn't stand to waste those apples! Love your centerpiece...it would be beautiful at Christmas with greenery tucked in around red apples & be festive with oranges or clementines too! Being close to Williamsburg -- I've often seen those forms at Christmas with the red apples -- you're the first one I've ever seen put all green apples on it -- a whole new and wonderful look! Thanks for sharing. I love going to Christmas events like that. they are not enough of them. 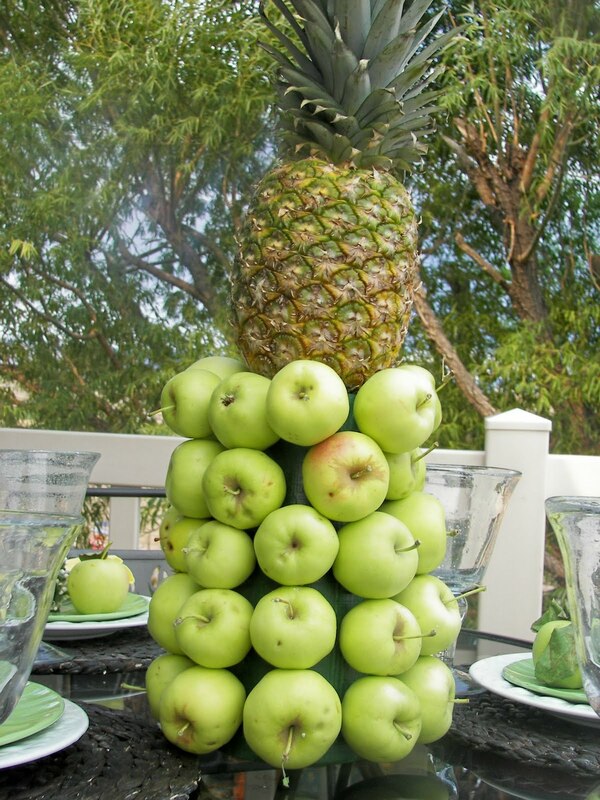 Love your apple centerpiece. I made one last Cmas fro the first time on this blog. My inspiration was Colonial Williamsburg. I love the British Colonial style. So this table was a home run for me. Very nice. Thanks for stopping by. 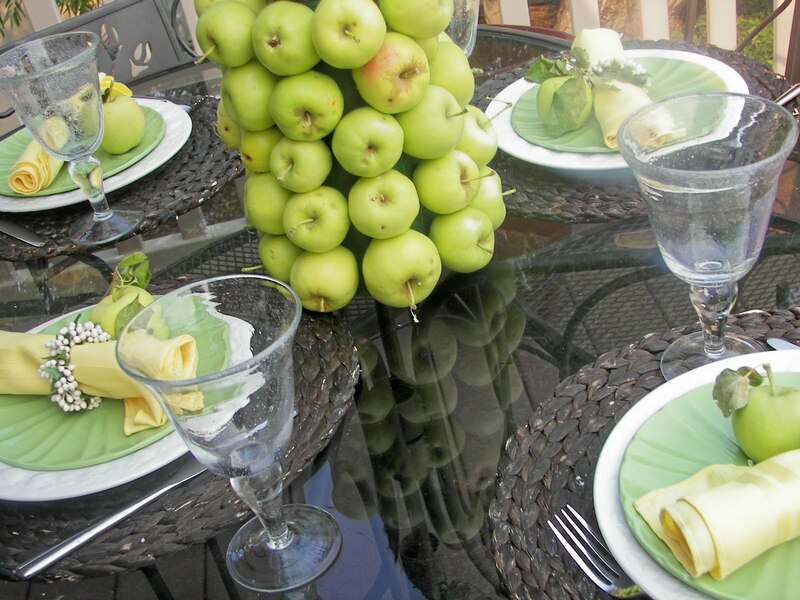 Beautiful setting, love your apple centerpiece! and he's got enough to tease me about already. LOVE how it looks, though. what a great Thanksgiving table centerpiece it would be. Very unique centerpiece! Love the story about your husband...LOL! What a neat centerpiece! I love using pineapples...I just often forget to! In Newport RI you'll see them used everywhere, too! Oh, that centerpiece is just lovely! I loved reading about its origin too. I feel like I can just smell those apples and pineapple. Lovely! Hi Joni! Wow, this is some tablescape you have here. You are so creative. 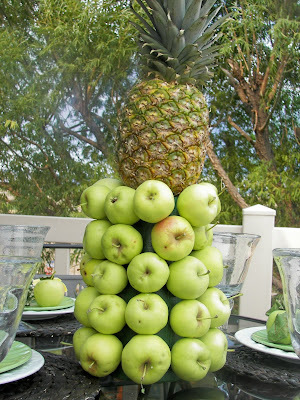 Thanks for the excellent idea too with the apple centerpiece. Thanks also for dropping in to visit my Christmas blog. I had a quick look at what other people have said about custard powder and quite a few have said the ingredients are very similar to a North American Vanilla Pudding Mix. I guess you could give it a try and see how it turns out. You could also use cornstarch and maybe use a bit more vanilla for flavour. I would love to know the results if you do try it. I can then add your recommendations to the recipe if you don't mind. This is lovely and perfect for all of the holidays ahead. You table setting with the pears is so pretty too. Did you get my email about the rooster? Just email me your address and he'll find his way to your home! Thanks so much. 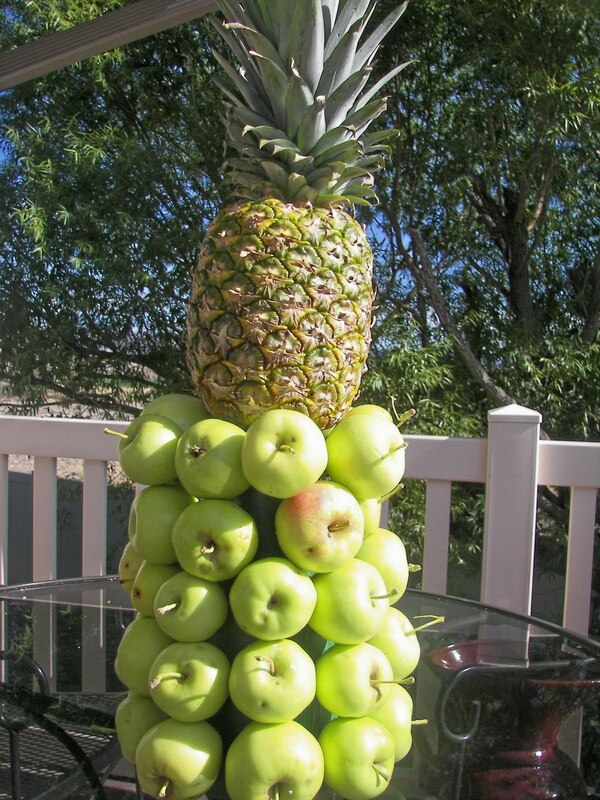 I really enjoyed your pineapple/apple centerpiece and the information. It reminded me of our mall in Dallas, NorthPark, for past christmases they have used these same forms for fresh fruit. The table is so pretty and very inviting.